Observe the following scenario: You’re at home eating dinner with your family and there’s one slice of pizza remaining in the box. You sit at the table, contemplating whether or not you genuinely want that last slice. You finally decide that you’ll probably take it when only a short moment later, your brother inquires if he can have it. Naturally, your desire to have the slice grows exponentially. You win the verbal exchange, eat the slice of pizza, and ultimately feel less than satisfied when it’s all said and done. The slice disappointed not only on the scale of deliciousness, but also lacked crunchiness in the crust and contrary to its appearance, contained an insufficient number of toppings. * Corsi measures shot attempt differential (the differential in shots directed at the opposition’s net versus the net of the player’s own team while on the ice). It includes goals, shots on goal, shots that miss the net, and blocked shots. Statistics courtesy of war-on-ice.com and espn.go.com. Other noticeable improvements to Kadri’s game include his decision-making both with and without the puck (he’s become a smarter, more responsible player) and his playmaking abilities (he’s now constantly looking to set up teammates, sometimes to a fault). 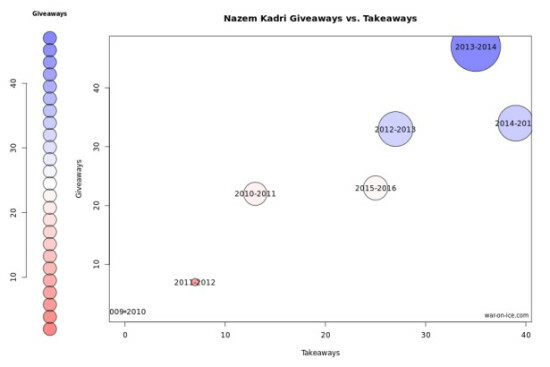 Nonetheless, Nazem Kadri is still not as good as he should be. Bottom line: his offensive production should be significantly higher than it is. In 48 games thus far this season, he has just 10 goals and 16 assists – respectable numbers in general, yet for a player of his talent, only sub-par. He’s currently in the prime of his career at age 25 and has yet to truly make his mark in this league. 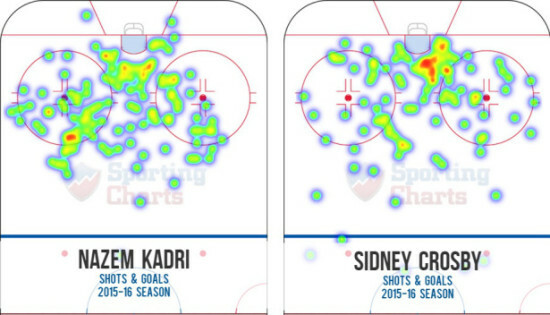 So what’s preventing Nazem Kadri from reaching “star” status? Some may think he’s too small and lacks physical strength, while others believe he simply isn’t fast enough or insist that he’s always just been overrated. Well, all these people are WRONG. The true culprit? When Nazem Kadri shoots the puck, he reaches out, winds up, and then pulls the trigger. The absence of a quick release. When an NHL goaltender has ample time to square up to a shooter, it’s rare to see the puck to beat him. On the contrary, the quicker the shot, the more difficult it becomes for the goalie to react in a timely fashion and thus the more likely a player is to score. Akin to what they say in baseball about a player needing to “shorten up his swing”, Kadri needs to shorten up his shot. By reducing his wind-up motion, he’ll be putting himself in a position to generate more quality scoring chances. The best players on the planet – the Crosbys, Ovechkins, Kanes – all have lightning quick releases; the puck is barely on any of their sticks before it’s gone. Remember Patrick Kane’s 2010 Stanley Cup winning goal? How about Sidney Crosby’s “golden goal” at the 2010 Olympics? In a league where the reflexes of goaltenders are so incredibly fast, a quick shot is invaluable. When a player can add this tool to his arsenal of weapons, he automatically becomes a greater threat on the ice which forces opposing players to defend him more closely in the offensive zone. More ice then opens up for his teammates and with one quick move, this player is able to easily elude a defender and create space for himself. Now, perhaps Kadri’s offensive struggles can be attributed to not shooting the puck enough, right? Wrong. Statistics courtesy of war-on-ice.com and espn.go.com. He’s already registered the same number of shots on goal as he did last season, and has done so in 25 fewer games! He’s averaging 3.7 shots on goal per game, tied for 9th best in the league. His shooting percentage (the percentage of the time a player scores when he shoots the puck on net), however, has declined steadily with each successive year. So surely the London, Ontario native must be shooting from the wrong areas of the ice, right? Wrong again. As illustrated through the above shot tracker graphic, Nazem Kadri takes the bulk of his shots from roughly around the hash marks inward. Interestingly enough, he seems to shoot the puck most frequently from the same regions as does Sidney Crosby: the two largest blobs present on the trackers of both players are right around the crease area and just beyond the hash marks. Keeping this information in mind, with 35 fewer shots on goal this season, Crosby has 7 more goals and a shooting percentage a whopping 6.4 percent higher than that of Kadri – this season being the worst of Crosby’s career. The explanation? Crosby simply shoots the puck faster. That’s all it is. Should Nazem Kadri release the puck quicker when he shoots, I guarantee a visible increase in his production. It’s all in the release, Naz. It’s all in the release.